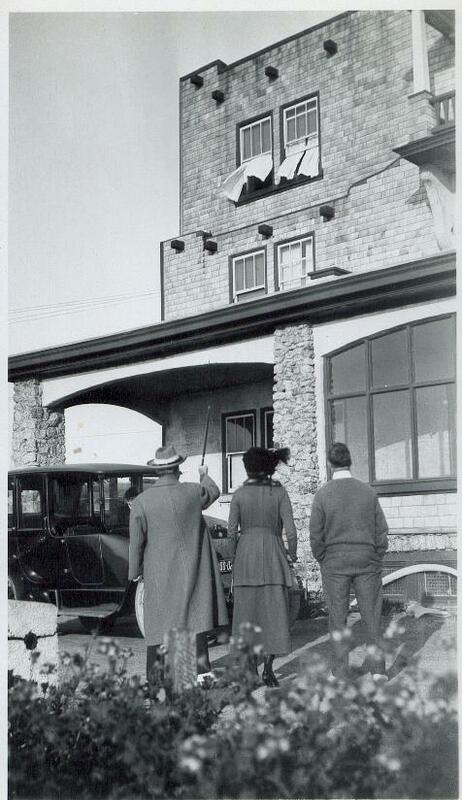 On New Years Eve 1934 the superrich, eccentric George Whittell slipped into his chauffeur-driven automobile and began the bumpy ride from his Woodside estate, where at least one lion roamed about, and headed over a squiqqly road to the Coastside, to the Marine View Tavern in Moss Beach, and its host, Billy Grosskurth, the man with a showbiz past. Since the end of prohibition business had grown quiet at both the Marine View and its neighbor, Franks, a llively roadhouse which had been built six years earlier. At the peak of prohibition, in the late 1920s, politicians and silent film stars wandered back and forth, between Billy’s hotel and the newer place next door. The final minutes of 1934 were ticking away when George Whittell pulled up in front of Billy’s three-story hotel overlooking the Pacific. We can only imagine how shocked and stunned witnesses were when the elegantly dressed millionaire got out of the car with a lion cub on a leash–it was as though he were walking his pet dog. I don’t know what brought George Whittell to Billy’s hotel. Maybe it was on a whim, to celebrate the closing of the old year in Moss Beach. What they talked about I haven’t a clue. Charles P. Tammany, Whittell’s chauffeur, said that Billy invited Whittell and the adorable five month old pet lion into the hotel. Against the advise of Whittell, added the chauffeur, Billy began to play and tease the lion. The lion was so cuddly cute, but at that moment it wasn’t feeling playful–and started to maul poor Billy. Or so he said in the lawsuit that followed. “It was a wild African lion of vicious and irascible nature,” testified Billy Grosskurth. “It was a friendly gentle little lion kitten of kind and amiable temperament,” countered George Whittell. For the terror and mauling he suffered, Billy sued the Woodside millionaire for $250,000. He added that Whittell was of a depraved and vicious character and delighted in the animal’s attack. But Billy was no match for George. Whittell, playing a game he was long familiar with, responded that he was a Nevada resident which may have technically protected him from Californian litigation at the time– (remember, Whittell had built the spectacular Thunderbird Lodge at Lake Tahoe, on the Nevada side, which I have visited, and can assure the reader of its uniqueness, in particular, the underground tunnel where Bill, the lion roamed freely, and where George, after a late night of drinking and gambling took his friends on a tour–). A year later Billy Grosskurth’s lawsuit was dismissed. As for the Marine View Tavern, the glory of what it had been during Prohibition continued to fade but Billy refused to sell the property. By the 1950s the building was decaying–and Billy became a familiar sight on the porch, playing solitaire and reminiscing about the past. 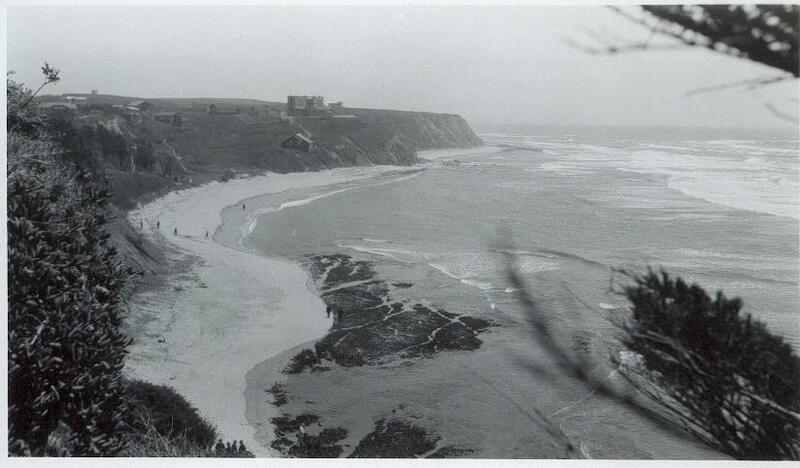 During the summer of 1958 there was a fire in Moss Beach and the Marine View Tavern hotel was torn down. The hotel had been Billy’s life and a year later he died at age 75. Previous PostPrevious Is This a Dangerous Place for A Bus Stop?